Day 4 was about as crowded as yesterday it being the weekend still. It was quiet for the morning for just a moment, but by lunch time it was the same mad house as yesterday, but I dare say it was worse. I did managed to get a lot done though, so let's get to it ! For our first stop, Dion really wanted to get a copy of Russian Railroads. He played it the day before and I got the chance to watch them demo it. He loved it to pieces and I can see why. I overlooked it cos I thought it was a train game, but boy was I wrong. It's a worker placement game with a train theme ( which to me is still boring ), but it's so tight and filled with interesting interlocking pieces that I too was interested to pick up a copy. After that we split up as I had things to get done. I made a stop to try out a game from an independent Japanese publisher ( more like a 3 person team ). 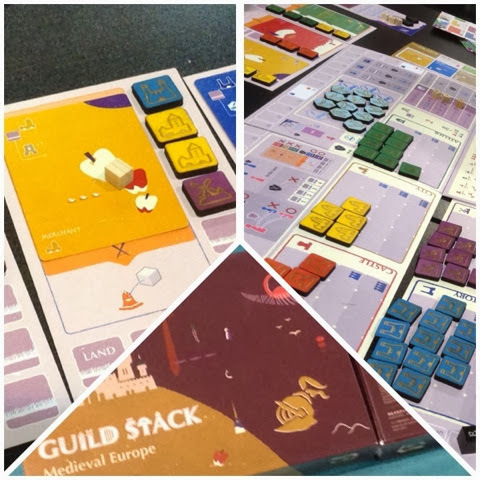 The game is called Guild Stack. I wanted to get a demo in badly as it seemed like a really interesting game. As it was early I managed to walk into a 3 player game. In guild stack, players are trying to build an engine and race to 40 victory points. 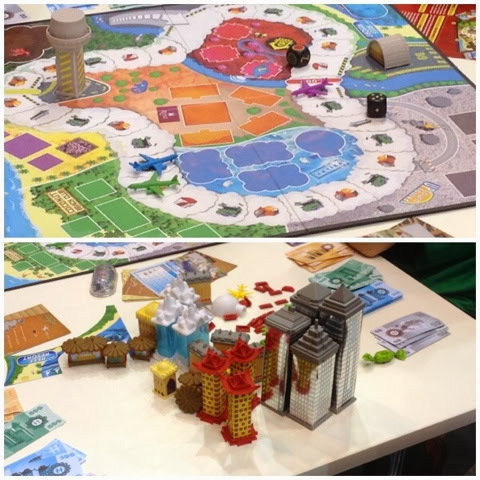 Each turn players may take a building and using the right combination of buildings they may then hire an occupation. The occupation cards are how the engine starts and gets modified. The occupation abilities are effected on certain scenarios such as when a player takes a particular building type, or whenever players hire an occupation. 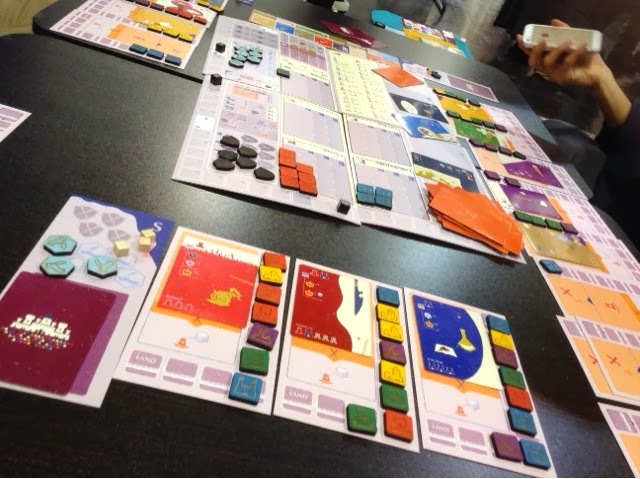 Through the combination of buildings and occupations, each player tries to outdo and restrict the actions of the others and battle towards the victory condition. I like the idea of it and the execution was pretty smooth. The problem with the game was that the card deck had no order and what happened in our game was that in the first round there was only one occupation that could have been hired in one turn, so the first player got it and me and the other player had no occupation till turn two. It may only be one turn but the engine was already up and running and being first is a HUGE advantage in the game. The engine in the game is unique in that it starts to operate when other players take their turns. So when you go first you get a card first and it immediately works during the turns of the other players. Another issue is that it's terribly difficult to plan ahead. The occupations on display are washed after each round. So you are basically taking buildings blind and hope that a good card with the buildings you already have will come up next turn. It was merely ok, but at 40 euro I would have to be Scrooge McDuck to buy it there and then. After that I went around exploring with a different group of friends. They were there for the whole convention period but that was the first time I had time to meet them. It's really a different feeling when you experience the fair with different people. It's not just the personality of the people but more of how different (?) you each are when it comes to your passion for gaming maybe ? Not sure if that even makes sense. Well, above is an image for the reprint of hotels. The buildings are still great as before but not sure how well the reprint will be received. 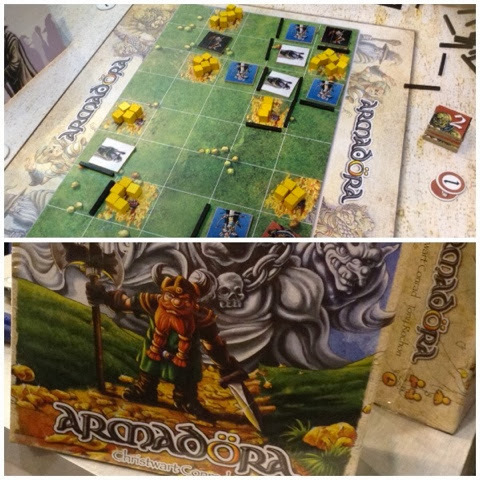 I subsequently managed to get in a demo game of Armadora. I enjoyed their previous game "The Boss", so decided to see if this was just as good. It involves an element of bluffing and area control. Each turn you may either place a token face down or place two walls on the board. Once all tokens are used, you flip them over and divy the gold according to the plots of land that have been formed ( with the higher numbered tokens taking all that is available in the plot ). The player or team with the most gold is the winner. The game is definitely light but I thought it was decent. I would play it again but not for an extended period of time. Dion and I met up again and he wanted to check out a game called Ebbes as it was pretty high on the FairPlay list of hot games. 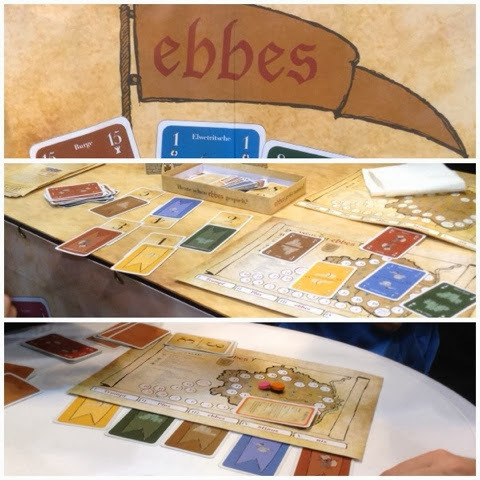 Ebbes is a trick taking game with a big twist. The twist is that in each game the trump and scoring options are determined by the card play of the players. There are five colors in the game and each number one card that is played determines the effect of the color of the card. The first number one determines trump. So lets go by the picture above, if the yellow one appears first, then yellow is the trump for the round. If the second number one to appear is green, then green is the color that awards points for the round. The other three effects are: get points for neither being least or most in that color, getting negative points, and getting nothing. Ebbes actually would be interesting if I was at all into trick taking games. It sounds dynamic and different enough to exist in a market with many trick taking games. 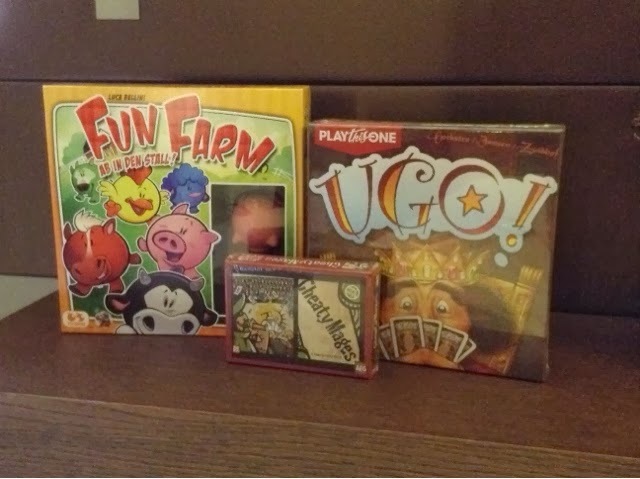 However I'm not really a trick taking kind of guy not because I don't like it ( I love bridge and tichu ), but rather because I can never find friends to play it with. So it immediately drops out of my list. But if you like trick taking, do check it out ! Well the day was going great so far, but really the best was just round the corner. And I wasn't even expecting it. 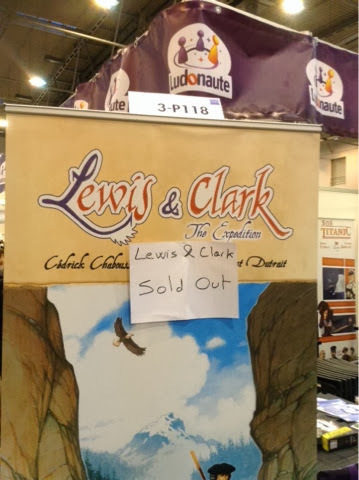 After walking the same halls and the same booths for 4 days in a row, it was a most delightful surprise when I went by the CGE booth again for the upteem time and saw this. Oh be still my beating heart ! Well, I'm not in love with Mr David Cochard but rather his artwork and style. 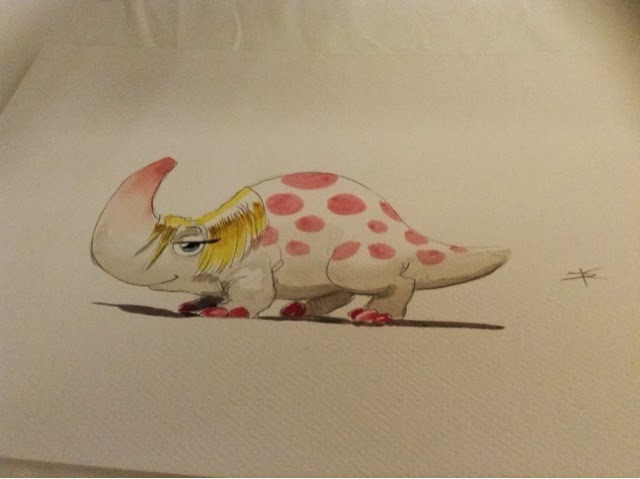 He did the art for the Dungeon series ( lords and petz ) and also CGE's latest release Tsah-Kalar. Well he was there to sign and draw for you ( as you can see in the picture ). 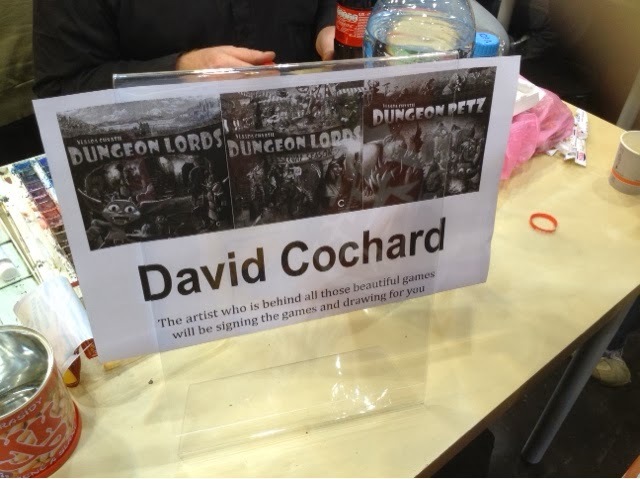 I didn't have my dungeon petz expansion box with me so I needed proof before he would do an art piece for me. Well, thank God for technology ! I showed him my Essen opening day loot photo and that was enough. But before me were quite a few people and take a look at what he did for them. 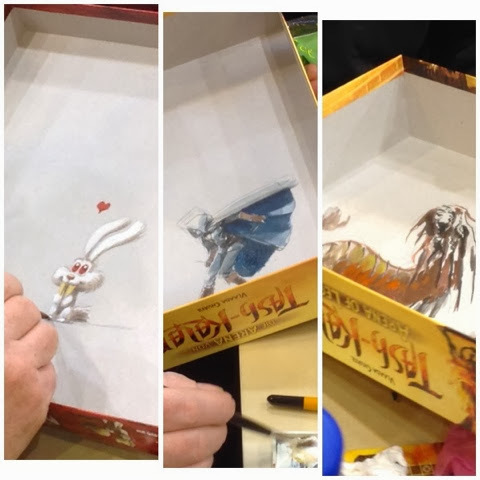 He did another direbunny which had more detail but I was so star struck I didn't take a photo of it. I know a lot of people are component people, but really for me, art style trumps components any day. Wooden pieces and metal tokens cannot beat the sure beauty of a game. A beautiful game with plastic or flimsy components will win my heart more than a heavily produced game, thus my admiration for all these artists who make our hobby beautiful and engaging. And I also know that some people are going to say what ! That's the best part ? It's not even a game ! 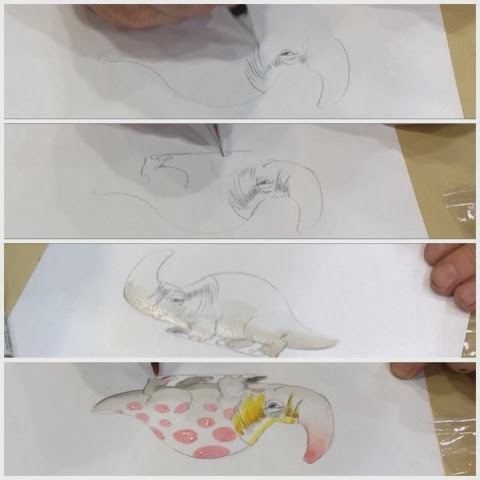 But honestly and truly this is what I really love conventions for. The chance to get and do something you otherwise cannot get or do on a regular day. Of all the games I bought, most can be bought or imported from elsewhere ( though Japan and Korea games are rather difficult ), but a signed and hand drawn art piece ? Priceless. And in its final glory ! This took a total of 10 mins ! His skills are a sight to behold and I'm thrilled to have been able to witness him in action. Really one of the major highlights of my convention. By the time this was done, it was evident the convention was coming to a close. Many places were sold out of stuff or packing up. 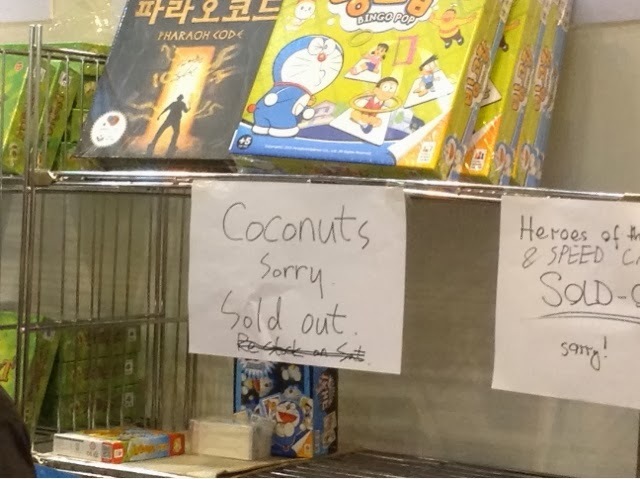 Coconuts was sold out on day 2, but I'm showing it cos I liked that they put sorry there, haha, a lot of people just go "sold out!" 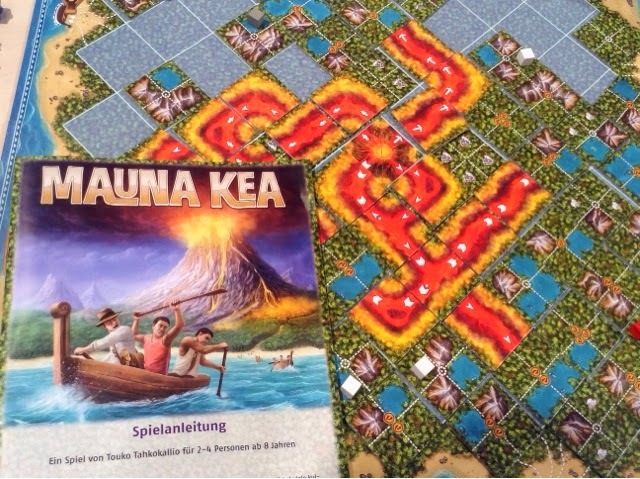 As the fair was closing, tables were emptier than they had been for awhile, so I took the chance to try one of the games I was keeping at the back of my mind, and that is Mauna Kea. 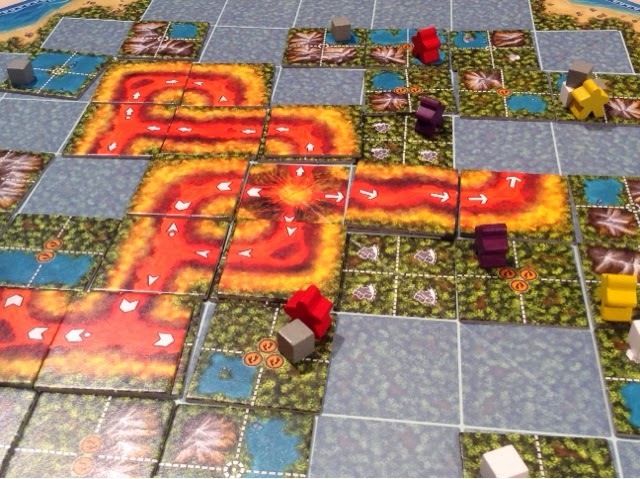 It gives off a very similar vibe to survive!, basically you are once again meeples that are tying to escape an island. This island instead of sinking, is actually being consumed by lava. 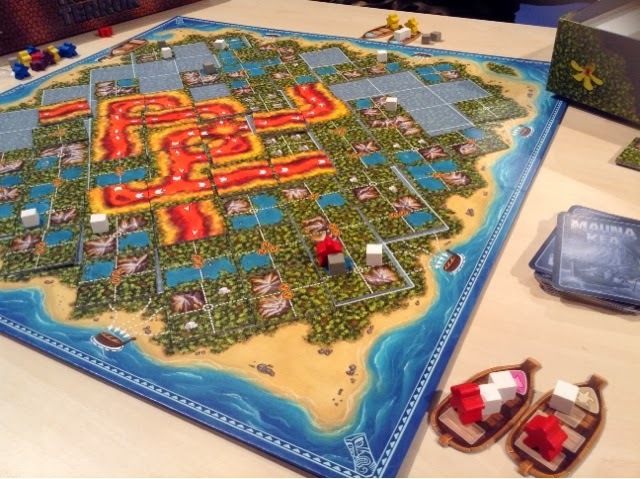 In survive you flip tiles to sink the island, and there's immediately ways to mess with you opponents, but in Mauna Kea, you are placing tiles from your hand to escape the island. Tiles are multi usable where you can either place them as paths to walk on or to discard them and move your meeple as many spaces as there a foot icons on the tile. Some places are impassable and some require more points but that's how you escape. You also want to collect artifacts with you along the way as that would give you more points. After your turn is over, you will draw tiles to replenish your hand to at least 5 movement points. This is where you may accidentally draw a lava tile and start to cover the island following the arrow types and direction. Mauna Kea was great fun. It's a light hearted game that heavy game lovers may not appreciate, but it's lovely to play for what it is and there are some difficult decisions to make especially when you are being enclosed on both sides by lava. It may not stand up to repeated plays but it's definitely something to take out for the families. I do recommend it strongly if you need one for family time or children time ( just make sure they can take being blocked or swallowed by lava ). The one thing that surprised me as I was leaving the halls was that I found a booth I had not even seen or noticed for the past 3 days ! They weren't selling much but they are the publishers of a game I enjoy for its silliness - Make You Gunfighters. They had a new solitaire game on display called Shephy. I gave it a go but I will record my impressions of it on a separate post. Does that mean it's great ? We'll see, ;). You'll find out ! So that's how Essen ended. As quickly as time has passed, it was just as quick in tearing down. Before 7pm, trucks were coming in to pick up unsold games and booths were gone from where you once knew they were. It was kind of a sad feeling. I was told you should leave the fair before the fair leaves you. But since my flight is only on the next day, I stayed all the way. I didn't feel like the fair left me though, but more like I left a part of me with it. It was like a home for 4 days. Gaming heaven so to speak. And now it's gone you wonder when you can next be a part of something so epic. It was worth every penny spent and it's something I will always treasure. Some friends will always think it's tremendously geeky and silly to fly all the way for a games convention, but when it's something you truly love as a hobby, it's one of the best things you could ever gift to yourself. Well, one last day of loot. There being sales and all the allure was too great. These are mainly for me to play with my church kids, I think they will enjoy them. To all who have been faithfully reading all my posts, thank you for your time and for finding what I have to say interesting. 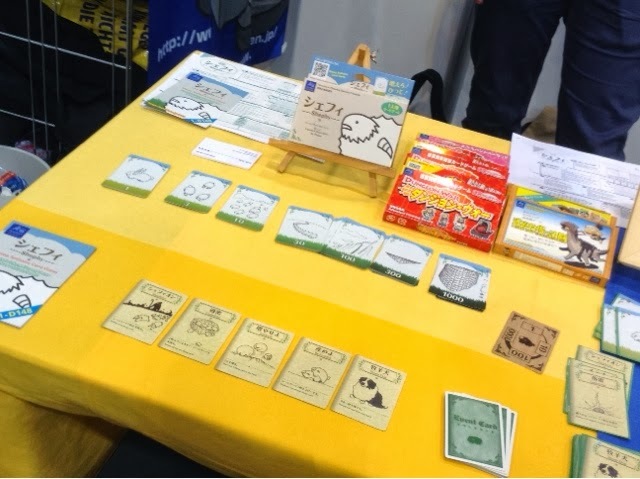 I hope it brought some sense of how Essen was this year and that you found some games that interest you; or at least were brought to your attention for further research. Take care and happy gaming !! Thank you for your review ....... Mauna Kea does remind me of The Downfall of Pompeii in some way ....... looking forward to both Eric and your comprehensive review of those games you people had bought. Ciao!